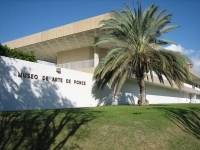 The Museo de Arte de Ponce contains one of the largest art collections in the Caribbean, housed in a building designed by Edward Durrell Stone, who designed the Museum of Modern Art in New York. The impressive building is comprised of seven interconnected hexagons topped with glass cupolas. Inside its walls are more than 1,000 paintings and 400 sculptures covering classical, ancient, and contemporary works. Among the prizes of the collection are works by Velasquez, Rubens, and Rodin, as well as a celebrated collection of Pre-Raphaelite works. Puerto Rican art also features strongly.